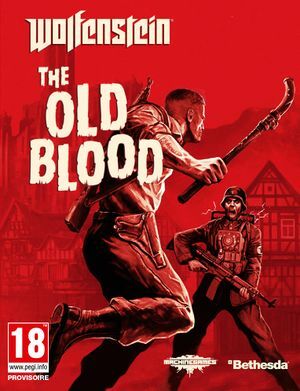 Normal Windows shortcuts do not work to relocate the MachineGames folder or the Wolfenstein The Old Blood folder to another drive. Slow HDD can prevent from achieving high FPS. Consider placing the file on an SSD or RAM disk. Warning - this can cause subsequent cutscenes to not play for some users. Find ;r_skipfog 1 and remove the semicolon. Limited selection of controller layout presets. Master volume and voice volume sliders. The German Edition only includes the German language. Experiencing this can be a nuisance if you prefer re-binding actions to these buttons, such as binding melee to mouse 5. Disable any other devices that show in Device Manager under "Mice and other pointing devices." Usually any "Gamer" peripherals like the Razer DeathStalker could include mouse functions that prevent some games such as Wolfenstein to not recognize some functions of your main mouse. Depending on which device was interfering that you had to disable, your peripheral may lose some functionality such as macro keys or any keybindings that mimicked mouse functions. However normal keys should still work fine. The game will no longer show artifacts on textures. In game performance and loading times may suffer greatly. Not advisable for use with GPU transcoding or on a lower end PC. Requires much more VRAM. Do not delete the WolfOldBlood_x64 file or else it won't work. Make sure that the two laucnh file are in the game folder, WolfOldBlood_x64 and WolfOldBlood_x32. 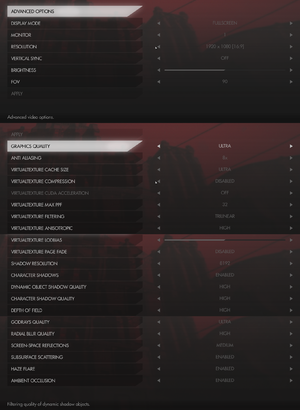 Steamless binary update 1 achieves few FPS more. Keep Steam in background, in offline mode. No Internet connection. VIRTUAL TEXTURE MAX PPF: 16 (0 or 1 is the fastest - but more texture popping, in some cases 64, in others 128 or even around 10000 [set in console - vt_maxppf - it resets after game closing]). ↑ 1.0 1.1 File/folder structure within this directory reflects the path(s) listed for Windows and/or Steam game data (use Wine regedit to access Windows registry paths). Games with Steam Cloud support may store data in ~/.steam/steam/userdata/<user-id>/350080/ in addition to or instead of this directory. The app ID (350080) may differ in some cases. Treat backslashes as forward slashes. See the glossary page for details. This page was last edited on 30 March 2019, at 06:10.